The second Tautog (SSN-639) was laid down on 27 January 1964 at Pascagoula, Miss., by the Ingalls Shipbuilding Division of Litton Systems, Inc.; launched on 15 March 1967; sponsored by Mrs. Albert Gore; and commissioned on 17 August 1968, Comdr. Buele G. Balderston in command. On 30 August, the nuclear-powered attack submarine departed Pascagoula on her way to join the Pacific Fleet. She transited the Panama Canal on 8 September and arrived in Pearl Harbor on the 23d. There, she joined Submarine Division (SubDiv) 12 as its flagship. During the next 12 months, Tautog completed her round of post-commissioning tests and trials as well as her shakedown training. She conducted the majority of these operations in Hawaiian waters although, in January and February 1969, the submarine returned to the mainland for trials and repairs at the Puget Sound Naval Shipyard. She completed her shakedown training in September and, on the 15th, began post-shakedown availability which was protracted by the necessity of replacing her entire diesel generator. Tautog's repairs were finally completed on 19 February 1970, and she began normal operations out of Pearl Harbor-mostly torpedo and sonar tracking exercises. That routine lasted throuh the summer and into the fall. On 9 October, the ship exited Pearl Harbor for her first Far Eastern deployment. She reached Buckner Bay, Okinawa, on the 23d and joined the 7th Fleet. During her stay in the western Pacific, the nuclear attack submarine spent all of her sea time engaged in antisubmarine warfare (ASW) training-usually with units of the 7th Fleet but, on one occasion, with the British cruiser HMS Aurora. When not at sea, she made port calls for liberty and repairs at such places as Subic Bay in the Philippines; Hong Kong; Yokosuka, Japan; and the South Korean port of Pusan. 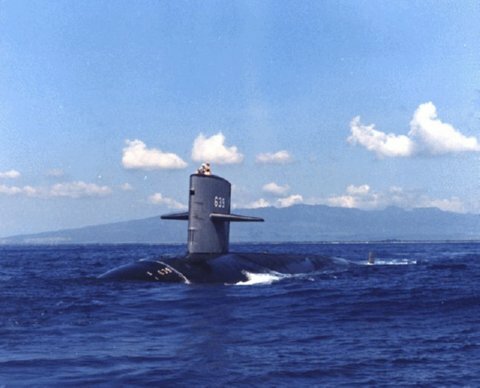 The nuclear-powered attack submarine concluded her first tour of duty in the western Pacific on 28 March 1971 when she sailed out of Yokosuka bound for Hawaii. Tautog arrived in Pearl Harbor on 5 April and resumed her routine of upkeep in port alternated with periods at sea engaged in ASW training. The warship pursued that schedule of activities through the remainder of 1971 and during the first three months of 1972. On 21 March 1972, she put to sea for a special operation. During that mission, she called briefly at Guam and at Subic Bay. At the conclusion of the assignment, Tautog made a liberty visit to Hong Kong before returning via Guam to Oahu. The submarine arrived back at Pearl Harbor on 31 August and conducted operations in the Hawaiian Islands for the remainder of the year. On 15 January 1973, the warship entered the Pearl Harbor Naval Shipyard for her first regular overhaul which was not completed until 15 April 1974. On that day, she resumed local operations out of Pearl Harbor which-except for a voyage to the Pacific Northwest which lasted from late July to early September-occupied her time throujgh the first four months of 1975. On 3 May 1975, she exited Pearl Harbor for another series of special operations in the Central and western Pacific. That voyage included a period in drydock at Guam during the first week in June as well as exercises in the Philippines near Subic Bay. Ports of call once again included Subic Bay and Hong Kong but no Korean or Japanese ports. Tautog returned to Pearl Harbor on 18 October and resumed her schedule of training and upkeep. Type training, independent ship's exercises, inspections, and evaluations-all conducted in the Hawaiian Islands operating area-consumed the submarine's energies for the next 15 months. She did not deploy overseas until the beginning of 1977 when she got underway for a goodwill visit to Mombasa, Kenya. Departing Oahu on 3 January, she reached her destination on the 24th and remained there for a month while her crew saw the sights and she received visitors on board. Tautog returned to sea on 24 February and started east. On the way home, she received orders to join a hastily organized task force built around Enterprise (CVN-65) and to return to the East African coast. In Uganda, President Idi Amin had precipitated a crisis by rounding up all Americans resident in his country in response to President Carter's condemnation of the murders of two of Amin's Ugandan opponents. While the United States and the world waited for Amin to make his mind up with regard to the hostages, Tautog cruised the Kenyan coast-Kenya stands between landlocked Uganda and the Indian Ocean-with the Enterprise group both as a show of American resolve to protect her citizens and as a scratch force to try for a rescue had it become necessary. As he had done many times before, Amin eventually relaxed the pressure and freed the foreign hostages. Tautog was released from the special task force and resumed her voyage east, arriving at Guam on 19 March. Tautog visited Chinhae, South Korea, in April and, on the 20th, arrived in Subic Bay for a series of special operations in the Philippines. Early in May, Tautog made a liberty call at Hong Kong and then returned to Subic Bay on the 18th. Special operations occupied her time in late May and in June. On 3 July the submarine arrived back at Oahu to resume local operations. Following completion of post-deployment standdown on 8 August, Tautog conducted local operations in the Hawaiian area until she departed Pearl Harbor on 2 December to proceed to the Mare Island Naval Shipyard, Vallejo, California, for overhaul. This overhaul, which included the refueling of her nuclear core, took Tautog into 1980.